Plasma turbulence at scales of the order of the ion inertial length is mediated by several mechanisms, including linear wave damping, magnetic reconnection, the formation and dissipation of thin current sheets, and stochastic heating. It is now understood that the presence of localized coherent structures enhances the dissipation channels and the kinetic features of the plasma. However, no formal way of quantifying the relationship between scale-to-scale energy transfer and the presence of spatial structures has been presented so far. 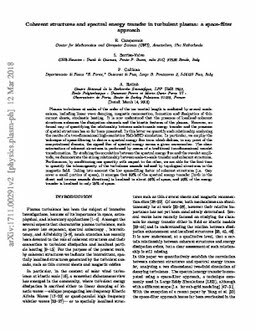 In the Letter we quantify such a relationship analyzing the results of a two-dimensional high-resolution Hall magnetohydrodynamic simulation. In particular, we employ the technique of space filtering to derive a spectral energy flux term which defines, in any point of the computational domain, the signed flux of spectral energy across a given wave number. The characterization of coherent structures is performed by means of a traditional two-dimensional wavelet transformation. By studying the correlation between the spectral energy flux and the wavelet amplitude, we demonstrate the strong relationship between scale-to-scale transfer and coherent structures. Furthermore, by conditioning one quantity with respect to the other, we are able for the first time to quantify the inhomogeneity of the turbulence cascade induced by topological structures in the magnetic field. Taking into account the low space-filling factor of coherent structures (i.e., they cover a small portion of space), it emerges that 80% of the spectral energy transfer (both in the direct and inverse cascade directions) is localized in about 50% of space, and 50% of the energy transfer is localized in only 25% of space.